Lentinula edodes, also known as shiitake the oak mushroom (in Japanese), and shiang-gu/xiang-gu, the fragrant mushroom (in Chinese), is grown usually on logs of oak outdoors in forests. Environmental manipulation of the crop is achieved by heavy watering, shading or positioning the logs in areas of different microclimate. The cropping period is 3 to 7 years. A more intensive cultivation technique has recently been developed involving growth on synthetic logs made by compressing agricultural wastes, mainly sawdust, into plastic bags. Lentinula edodes is largely produced in Japan, China and South Korea, but commercial cultivation is spreading to other parts of the world. 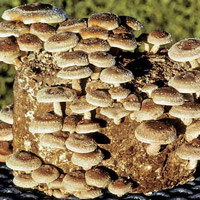 Lentinula edodes accounts for 15% of world production of cultivated mushrooms; the world-wide crop of L. edodes in 2002 has been estimated at 1.8 million tonnes . The shiitake (shi-i-TAK-ke) mushroom (Lentinula edodes) (Fig. 1) is closely related to reishi. "Take" is Japanese for mushroom and "shii" refers to the shii tree (Quercus cuspidata), an oak of central and southern Japan upon which shiitake most often grows. Shiitake is Japan's largest agricultural export and is now the most popular and most cultivated exotic mushroom in the world. 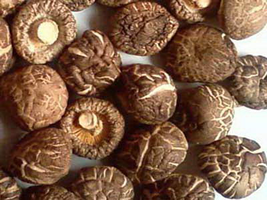 In China, shiitake has a history that dates back to the Ming Dynasty (1368-1644 AD) . The mushroom was used not only as a food but was taken as a remedy for upper respiratory diseases, poor blood circulation, liver trouble, exhaustion and weakness, and to boost chi, or life energy. It was also believed to prevent premature aging [3-5]. Fig. 1. Shiitake (Lentinula edodes) mushrooms. Today the shiitake is recognized for its antitumor action and is the most researched mushroom in regard to its immunological activity. The initial antitumor research was performed in 1969 by Tetsuro Ikekawa at Purdue University in West Lafayette, Indiana, along with colleagues at the National Cancer Center Research Institute in Tokyo. The researchers found that water extracts of shiitake and several other mushrooms collected in the wild produced high rates of tumour inhibition in mice (72 to 92%). Ikekawa later identified a polysaccharide in shiitake called lentinan as having powerful antitumor activity . When food tastes really nice you might expect it to contain too much sugar and fat to be healthy; but shiitake is different. This large fleshy mushroom is an exquisite food with a good nutritional profile and many scientifically proven medicinal benefits. Shiitake's delicate flavour adds a gourmet flair to almost any dish. Moreover, essential amino acids are present in a ratio similar to the "ideal protein" for human nutrition. Shiitake is rich in the amino acids leucine and lysine, which are deficient in many grains. Shiitake is also a good source of B vitamins . It is, however, shiitake's medicinal possibilities that are getting worldwide attention. In the last two decades, scientists have isolated substances from shiitake that may play a role in the cure and prevention of heart disease, cancer, and AIDS. Claims have been made that shiitake has medicinal value as a cancer preventive and in treatment of: colds and flu; virus infections; hepatitis; incontinence; environmental allergies; diabetes; high blood pressure; immune weakness; high cholesterol; chronic fatigue syndrome; poor blood circulation; upper respiratory diseases; exhaustion and weakness following antitumor treatments; and in alleviating the side effects of chemotherapy. Part of any positive medicinal effects of shiitake may result from it serving as a dietary supplement, particularly the provision of various amino acids such as isoleucine, leucine, lysine, methionine, phenylalanine, threonine, and valine, as well as vitamins B1, B2, B12 and also mineral salts. Regular intake may prevent rickets, especially in infants, which could be due to a disorder of phosphorus and calcium metabolism caused by vitamin D deficiency. This is because Lentinula edodes contains the provitamin ergosterol, which is not present in much quantity in vegetables, but is converted to vitamin D in presence of sunlight. Vitamin D increases resistance against illnesses and has preventive and curative effects on colds. Lentinula edodes also contains adenine and choline, which may prevent the occurrence of cirrhosis of the liver as well as vascular sclerosis. Tyrosinase contained in Lentinula edodes tends to lower blood pressure. Two other constituents which have been isolated from Lentinula edodes which tend to reduce serum cholesterol are: C6H11O4N5 and C9H11O3N5, namely [2(R), 3(R)–dihydroxy- 4-(9-adenyl)-butyric acid and 2(R)-hydroxy-4-(9-adenyl)-butyric acid]. The most extravagant claims are that Lentinula edodes is said to be the best example of those medicinal mushrooms from Asia that are foods containing cancer-fighting nutrients. Approximately 50 species of mushroom appear to have some medicinal value, each with its own unique chemistry [3-6]. Shiitake is claimed to be able to inhibit the growth of sarcoma 180 in white mice by as much as 97.5%, whilst inhibition of Ehrlich carcinoma is 80%. Reports in the New England Journal of Medicine indicated that giving shiitake to two patients with probable pre-AIDS improved the patients' general conditions and improved their immune status. The report concluded that this agent may prove to be effective in the suppression of the AIDS condition, but it suffers from the problems, common in this sort of report, that the sample size is very small and the results are qualitative rather than quantitative [3-6]. Lentinula is one of the most highly regarded herbal remedies in traditional Japanese and Chinese medicine. Used for centuries in Asia as food and remedy, it is one of the mushrooms that are now being drawn to the West's attention. Research suggests there are thousands of semiessential, nonvitamin factors in plant foods that protect against diseases. Many of these compounds, called phytonutrients, appear to slow, stop or reverse the multiple pathological processes involved in cancer development. Their disease-fighting potential is so promising that the National Cancer Institute (NCI) in Bethesda, Md., has allocated millions of dollars to find, isolate and study such phytonutrients. Because Asian medicine views people as ecosystems in miniature, it seeks to improve our capacity to balance and renew our resources. The holistic approach in Asian medicine can minimise the erosion of our health by enriching it, maximise the flow of nutrients by increasing circulation, and help prevent bottlenecks, psychological and physical, that can obstruct healthy development. Statements of this sort do not fit easily into Western medical ideas. Chinese herbs are usually combined in formulas to enhance their properties and actions. Symptoms and signs are matched with therapeutic effects, reflecting the particular conditions and needs of each patient. Western science abhors the holistic approach and is devoted to identifying specific ingredients that can be shown objectively and quantitatively to have curative value. In Japan, hundreds of mushroom species have been studied during the past 20 years. Most of the traditional medicinal mushrooms such as reishi, shiitake and maitake show a common property of enhancing immune function by stimulating cell-mediated immunity. Simply put, such mushrooms seem to "turn on" cells in the immune system, called T-cells, that appear to have significant cancer-fighting properties. This may be no less anecdotal than earlier claims made for these fungi, but in fact, three different anticancer drugs extracted from mushrooms have been approved by the Japanese equivalent of the FDA, the Health and Welfare Ministry. These three are lentinan, derived from shiitake; schizophyllan, derived from suehirotake; and PSK, derived from kawaratake. PSK, sold in Europe and Japan, is the best-selling anticancer drug in the world. In Japan, only 30% of cancer treatment includes radiation, chemotherapy and surgery. Despite this sort of research and Asia's long history of using medicinal mushrooms, Western authorities are still slow to move to human trials with such remedies [3-6]. Western medicine often intervenes only after a crisis arises, whereas Asian medicine attempts to anticipate problems by correcting earlier symptoms. Formulas are available in a variety of forms in Asian treatments: crude herbs to be boiled into tea, liquid bottled extracts, ground herbs packaged in pills, and powders. Herbs, more like foods than drugs, can supplement the diet and are claimed to fortify the constitution as well as prevent or remedy ailments. Sometimes long-term use of herbs is desirable whereas extended use of pharmaceuticals would not be healthy. Western medicine frequently has nothing to offer patients suffering from nagging chronic complaints that Asian medicine can help. The two are not a substitute for each other. They are often complementary. Whereas Western medicine may heroically rescue us, Asian medicine might be able to protect and preserve our health on a day to day basis. 1. Chang, S.-T. (2008). Overview of mushroom cultivation and utilization as functional foods. In: Mushrooms as Functional Foods (ed. P.C.K. Cheung), pp. 1–33. Hoboken, NJ: Wiley. ISBN: 9780470054062. 2. Stamets, P. (2000). 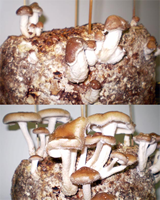 Growing Gourmet and Medicinal Mushrooms. Ten Speed Press. ISBN-10: 9781580081757, ISBN-13: 978-1580081757. View on Amazon. 3. Hobbs, C. (1995). Medicinal Mushrooms: An Exploration of Tradition, Healing and Culture. Botanica Press, Santa Cruz, CA.,U.S. 3rd edition. ISBN-10: 1884360017, ISBN-13: 978-1884360015. View on Amazon. 4. Smith, J.E., Rowan, N.J. & Sullivan, R. (2002). Medicinal Mushrooms: their therapeutic properties and current medical usage with special emphasis on cancer treatments. A report produced for Cancer Research UK. URL: http://sci.cancerresearchuk.org/labs/med_mush/med_mush.html. Chapter PDF. Complete PDF. 5. Smith, J.E., Rowan, N.J. & Sullivan, R. (2002). Medicinal mushrooms: a rapidly developing area of biotechnology for cancer therapy and other bioactivities. Biotechnology Letters, 24: 1839–1845. DOI: http://dx.doi.org/10.1023/A:1020994628109. 6. Ikekawa, T. 2001. Beneficial effects of mushrooms, edible and medicinal, on health care. International Journal of Medicinal Mushrooms, 3: 291-298. URL: http://dl.begellhouse.com/journals/708ae68d64b17c52,4cf0547d63409c36,1793be3351e10dfe.html. 7. Ingram, S. (2002). The real nutritional value of fungi. Section 4.12 of this website.